It sounds like you may need to go to a shoestore that will measure her feet, and find a place that sells shoes in real shoe sizes instead of 6-12 months, etc. I’d recommend Stride Rite. I’m not sure how small their sizes start, but they sell well-made, flexible-soled sneakers perfect for her stage and they have knowledgable salespepole that will measure her feet and get her in the right pair of shoes. I LOVE them — they’re so good with kids and the shoes LAST. Nathan’s on this third pair! When Nathan was her age he was in a size 4.5, so they must carry sizes smaller than that. Good luck in your search and let us know what you find! Stride Rite is on my list to hit this weekend. Even some good brands have those weird sizes, including Stride Rite’s Robeez. I think it’s because for most kids wearing shoes that small they have them for looks & are growing out of them faster. I’m just catching up on your blog so I don’t know if you’re still having issues with shoes. Addie’s feet are also quite small (she’s very much a size 3) and I’ve been buying her shoes at Kohl’s and not just because I work there. 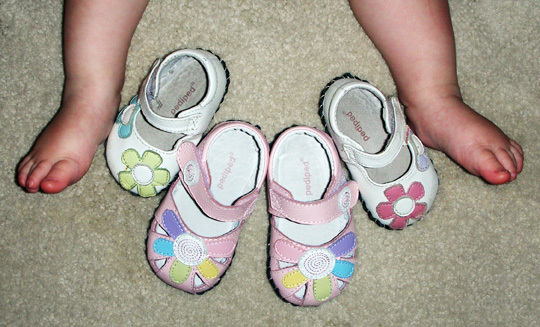 Though the infant/toddler shoes are limited they do have good flexible but sturdy soled shoes in smaller sizes. They offer Carter’s brands which are more fashionable than functional but the Jumping Beans brand (a Kohl’s brand) is actually pretty good and reasonably priced (which has been my biggest issue with Robeez. I hope this helps you some! !